Thankfully, as adults, most of us have developed enough emotional regulation to stop ourselves from fully expressing our rage. We might complain, yell or scream but most of us pull up short of causing physical or emotional destruction to those around us. Over time, we have developed strategies for managing impulses which include taking deep breaths, walking away, making other physical efforts to release steam etc. Our children are still developing this level of control and so, when they rage, more than anything, they need us to love them and support them through the intense hurt they are feeling. 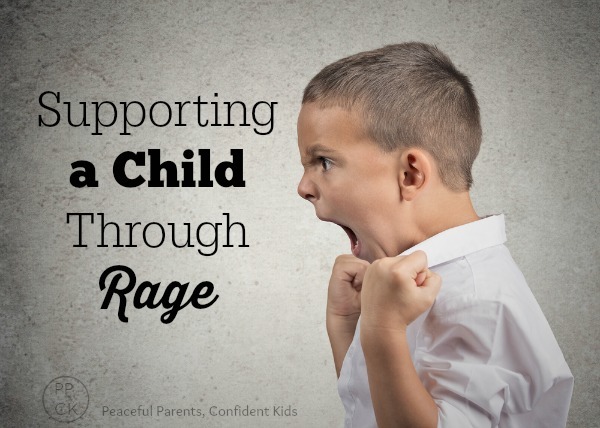 Like adults, there are a huge range of differences in the way children react to rage. Some children scream and flail in their parent’s proximity, others take themselves to their bedroom, slamming the door and vocalising their disgust to noone in particular and others take a more physical approach which can include screaming and shouting whilst hitting, kicking, pinching, scratching, throwing objects and generally causing destruction to those around them. As a parent of a child who engages in physically destructive behaviours when she rages, I have considerable experience with managing it – some good and some not so much. It is hard, possibly one of the hardest things both physically and mentally I have had to deal with as a parent in recent years. But I acknowledge that my hard and her hard are not comparable. Understanding how SHE must feel in those moments of being completely out of control, feeling that level of pain and anger, has made me reevaluate how I am helping her through these moments. I had thought, staying calm and level-headed whilst she rages (most of the time) was enough to give her the space she needed to work through her emotion. I had also confidently (read: sternly) let her know that it was not okay to hit/ hurt etc and I had helped both her and me achieve success with this by putting a door between us and staying close by until she calmed herself. Recently, however, these raging moments have been more frequent and more escalating as she has had to deal with some significant changes in her life. It has forced me to really think about the impact of my interaction with her during these hard times and made me realise that simply giving her time to work through it falls short of what she needs. RIE Associate, Janet Lansbury has always taught me to show understanding and acceptance of my daughter through all her behaviours and I was finding it increasingly difficult to demonstrate that I accepted her whilst managing these strong behaviours. She would lash out at me with hits, kicks, scratches and bites and I would let her know that I would not let her hurt me and then take her to her room where she could be safe to rage away from others in the family. I would endeavour to stay with her in her room to show support but would usually end up leaving when I could either feel my calmness waning or when she had screamed at me enough that she wanted me to leave that I believed she meant it. I would walk out of her room and close the door, letting her know I needed to keep myself and her safe and that I would wait right outside until she had calmed a little. The thing was, though, when I put the door between us, I was essentially saying “I can’t handle you. You are too hard for me, so you’re on your own with this pain.” More than that, I was sending her the message that there must be something wrong with her; there must be something that needs to be fixed. How hard would this have been for her to hear when her reactions to her burning rage were out of her control. Janet recently helped me understand that when she comes at me in the initial rage, I need to block her hits calmly but be careful not to overdo this. I was too focused on making her stop hitting (for good) that I was holding her too firmly and speaking to her too sternly. Janet explained that it is better to look her in the eyes and nod in understanding whilst gently deflecting her blocks. I tried this; I began to see my hands as hands of love not defense. Each interception I had with her was to show her how much I loved her and accepted her hard time; accepted HER. I gentled my voice. My words and tone spoke to her with kindness, not just discipline. She knows hitting hurts, she can not control this rage yet, so it is important for her that I go with her on her journey with love not contempt. When she screams at me to leave, I believe, now, that it is better for her that I stay. I know that she needs me to stay because despite her convincing requests that I leave her alone, she always follows me with her rage as I make my way to another part of the house. She wants me to hear all her anger and to reflect my love and acceptance back at her. I also acknowledge that I am stronger than her. I am capable of physically blocking or gently holding her without getting injured. Yes, I sometimes miss a hit but I am stronger and the pain is mild and short lasting in the grand scheme of things. I am not a victim though, and I will not play that parenting role. It would be equally damaging to my daughter for her to feel that type of power over me. It is important that I can show her that I won’t let her hurt me, however, I don’t need to put a door between us and I will only resort to that if for some reason I do not have the physical or mental capacity to do otherwise. So far, I have not had to do this since making these slight adjustments to how I deal with her rage in the initial instance. The other night, my daughter was enraged because her dinner had been removed after she had indicated she was done by leaving the table (this is a long-standing limit and she had been given a reminder). As she fought to access her plate I was able to soften myself and present her with nothing but love and understanding. I acknowledged her upset and nodded my head at her anger. I gently blocked her hits with hands of love and did my best to keep eye-contact. The rage dissipated within minutes. Her lashings became less convincing and she eventually crumbled in a heap on the floor. There was no need to tell her I wouldn’t let her hit me or that hitting hurt. It was about her and her pain in that moment. There were a couple of swipes in this altercation that scraped my arms a little but because of the love that flooded me and reflected to her, the pain did not trigger me or even really register. Since that time, there have been several other similar outbursts but each one has ended much more quickly than previous incidences and brought us many moments of connection as we work together to get through this phase. I can see in recent weeks, my daughter’s need to express herself in this way dissipating and I am grateful that I have been able to show her my love through her pain. Once again, I am realising how important it is that we show our children the kind of love and acceptance we ourselves crave. When we can do this and let go of our own hang ups about these triggering behaviours, we set our children up for a life of self-acceptance and eternal confidence. Holy moly. This is so timely and so helpful. I honestly feel like you just described my experience perfectly…..I have been trying to calmly set boundaries on hurting or even screaming, but feel like it just fuels it….True reflection allows me to see that she needs MORE empathy, REAL empathy. Not just “calm” response. But engaged, validating response. Nodding and eye contact, and NOT ABANDONING, even when she screams at me to leave. My daugther does exactly what you described, follows me around with her rage even after she yelled at me to leave……Thank you so much for shedding more light on this and giving me a vision of how to go forward! Goodness. I’m not even quite sure what to say. It almost sounds like a surrendering, but it isn’t quite the right word, something more like acceptance but again that doesn’t quite fit. In any case, like always you challenge my thinking on parenting and I thank you for that. This can be so confronting for parents and in the moment it can be so hard to even know what to do let alone do it! Thank you so much for sharing this scenario, it’s so helpful to read how someone deals with this stuff during a real life situation. This is such a fantastic article, and so needed for me in this moment in my life. I too am parenting a daughter (age 4.5) with intense emotions. Challenging doesn’t begin to describe it, as I’m sure you can understand. However, it’s also been an awakening of sorts — to myself as a parent and myself as a person. I would love to know more about “letting go of your own hangups over triggering behaviors,” as this is the MOST DIFFICULT thing for me to do consistently. Can you help point me in the direction of some key resources to help me change MY response, MY heart? Because more than the challenge of my child’s behavior, THAT is by far the most difficult hurdle. Thank you. I don’t have the answers for you in terms of key resources, Cara, but I definitely think there is a benefit to seeing someone to process things from your past you may not even realise is still having an impact. It can be very difficult to self-diagnose where are triggers are stemming from but it is possible to have a good guess and then be more mindful of this for future reference. I have a fairly good idea of the things from my past that inform my current behaviours and have to do a lot of self-reflection (much of it through this blog) to stay on top of it in my parenting. I know this is such a challenging thing to do and it definitely takes a lot of commitment. Thank you! Your post describes exactly what has been going on at our house. I too have been closing the door between my 4 year old son and myself during his rages which always include him hitting/kicking me. I would also say “I need to keep my body safe”..or something to that extent. I felt I had no choice but to close the door between us because I wasn’t always successful at blocking the hits. Saying “I won’t let you” was a lie because I was letting him so I figured I needed to distance myself. Despite thinking this was the right thing to do, it felt “off” to me. It felt like I was telling him I couldn’t handle him. Your post has confirmed what I’ve been feeling and next time I will stay in the room with him even if I can’t always block him. Thanks again. Love your blog by the way. This post really speaks to my heart right now, and has really helped clarify many things in regard to my approach with my intense 4.5 daughter. I can identify so very closely with everything you said. It’s amazing how over time our own triggers seep in and deter us from intervening in the ways we intentionally set out. I am a child therapist and new blogger, but am unfamiliar with the RIE approach and look forward to learning more!!! Thank you so much for being vulnerable enough to share your experience and insights. Thank you, Angela, I’m really glad it resonated and i’m especially honoured to introduce you to RIE. I think you will love it! Yes! My son will rage and I will lock us both in his room. I often have to sit against the door so he doesn’t open it up. I have been doing the same thing that you suggest and it has helped our relationship. During the rage it is HARD. As a parent we have to rise above and continue to be the model of self-control. It takes a lot of practice and reflection in figuring out what our own triggers are and getting past them. For me, I have a mode I get into… I can only describe it as meditative, where I look to myself as the anchor. I use calm, repetitive language– first validating his emotion, sports-casting, setting limits, and then redirection to appropriate emotional management strategies. So i say: you are so upset right now. You are so upset you are hitting me. I can’t let you hit me. You can hit a pillow instead. I hear you telling me you want to leave your room. We can leave when you have a calm body and voice. I want to help you work through this. It sounds like you are doing a wonderful job of being there to support your son through his emotions, Colleen. I look forward to checking out that article too. Thank you so much for sharing!